Click on the playlist to find out about tornadoes, earthquakes, mountains and much more. Click on "Explore the Outback", "Rocky Mountain Roundup" and "Jungle Rangers". Can you spot the differences in two beach scenes? This website uses Flash and may not work on all browsers. Curious minds can visit deep blue oceans, lush rainforests and dusty deserts, and find out about day and night and the seasons. With lots to spot and talk about, vivid illustrations and simple language, this is a fun and entertaining way to introduce little children to the world they live in. 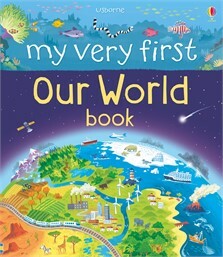 Friendly, accessibly and highly visual introduction to geography for the youngest children.